Necrophilia vs Beastiality. Who will she choose?!. HD Wallpaper and background images in the ハリーポッターｖｓトワイライト club tagged: twilight edward jacob necrophilia beastiality. This ハリーポッターｖｓトワイライト fan art contains アニメ, 漫画, マンガ, and コミック. Animal/human. It's illegal, and kind of gross. Edward isn't unresponsive, and Jacob doesn't have animal parts when he's human.. Indeed. She never liked Edward because he has no heartbeat, nor did she like Jacob because he turned into a wolf. 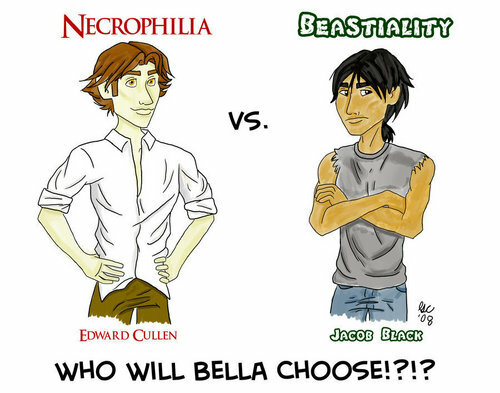 I've come to this realisation I reaised what Jacob was being called but it isn't beastiality! You can't call it that or my head might explode and my heart shatter!!!! Because then Tonks and Remus is bad. Yet, Remus is an awesome werewolf and not just an oversized dog. So, I don't think that counts. ^ Yeah, but that was basically the whole plot of Twilight, who Bella chose. Edward is still dead people....and Jacob is still a mutt.